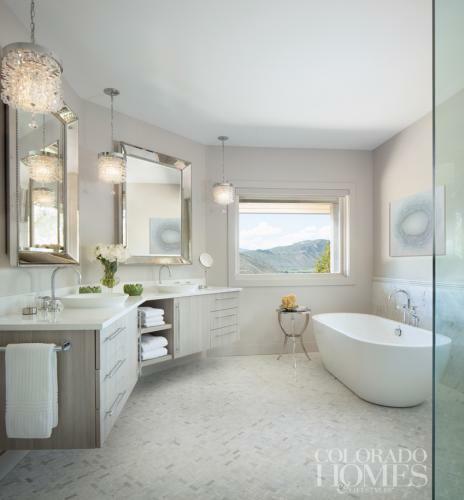 When interior designer Runa Novak, of Aspen-based In Your Space, first encountered this 1990s-era bath, it was dark and crowded “and there was a window with ruined wood actually inside the shower!” she recalls with a laugh. The original layout of the room was admittedly odd, with a door between the two vanities, and a “funky built-in tub” tucked away in a dark corner. “There were so many angles, diagonal lines and weird placement of windows,” Novak observed. “My goal was to open it up and make it lighter,” she says, and that’s exactly what she did, emphasizing clean, simple lines and calm pale shades of white, gray and taupe. 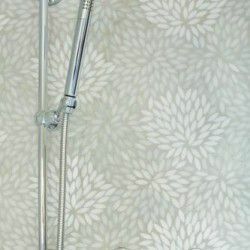 The exquisite handcrafted glass mosaic shower tiles set the tone, and the rest of the bath was designed to play a supporting role, in a similar color palette but with plenty of textural variety. Large Carrara marble wall tiles below the chair rail give a touch of elegance, while Asian Statuary marble in a basket-weave pattern makes a cool and sophisticated floor surface. Inner Waters 8 by Udo Nöger, from Denver’s Walker Fine Art, hangs above the freestanding bathtub. Novak drastically re-configured the room to make it more usable and comfortable: moving a door, putting together the two vanities, enlarging a window, relocating the tub and shower. “I played with the shape of the space that was given, and it worked,” the designer says. Novak called upon her commercial design experience to introduce floor-to-ceiling glass shower walls and a linear “trench” shower drain for an uncluttered look. 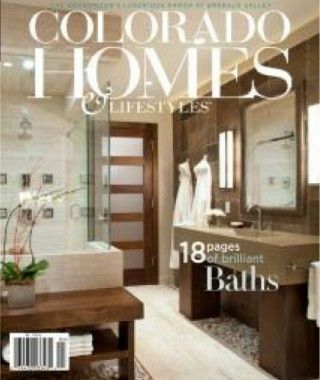 The floating vanity with pale customcabinetry is topped with a Caesarstone solid surface and semi-recessed vessel sinks. “And I went as big as I could go on the mirrors,” she adds. Crystal chandeliers from Uttermost Lights give the space a lively sparkle. When a room is nearly all white, it runs the risk of feeling cold and stark, but Novak’s deft touch manages to keep this bath textured, balanced and luxuriously icy-warm. If you have an irregularly shaped bathroom, stay away from heavy or chunky built-ins and fixtures that accentuate the room’s asymmetry. Play with items to camouflage the unevenness of the room—light fixtures mounted from a ceiling will hide the fact that the walls don’t match. Make the space open and airy by using floating vanities, a freestanding tub and open glass showers. Keep colors monochromatic. 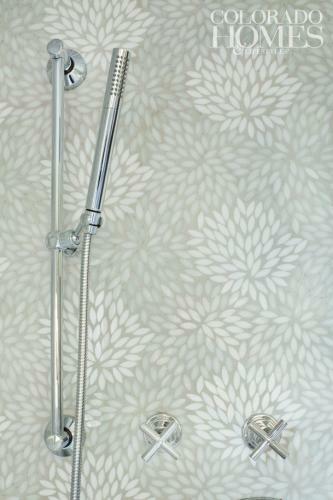 Have fun mixing shapes and sizes of monochromatic tiles. Believe it or not, it will never be too much. Create warmth through texture: blend different details in mirrors, decorative lighting and tiles. All good design comes down to a balancing act. I love contrasting items that complement each other.